On July 13, 1972, Shirley Chisholm became the first African American Presidential nominee and female Democratic Presidential nominee at the Democratic National Convention. Chisholm received 152 first-ballot votes at the Miami Beach, Florida convention. Chisholm was a woman of significant first, she became the first African American woman elected to congress in 1968. Congresswoman Shirley Anita St. Hill Chisholm was a representative of New York’s 12th Congressional District. She served seven terms from 1969 to 1983 in congress. 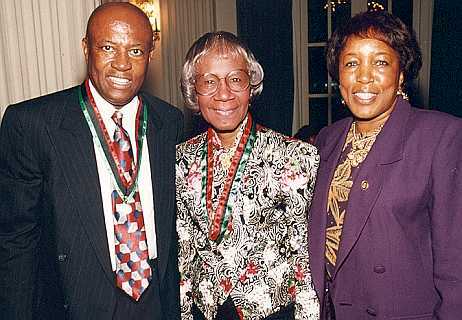 Chisholm was one of the founding members of the Congressional Black Caucus in 1971. Founding members of the Congressional Black Caucus. Standing L-R: Parren Mitchell, Charles Rangel, Bill Clay, Ron Dellums, George W. Collins, Louis Stokes, Ralph Metcalfe, John Conyers, and Walter Fauntroy. Seated L-R: Robert N.C. Nix, Sr., Charles Diggs, Shirley Chisholm, and Augustus F. Hawkins.